Ever Dreamed of Living With Your Airplane? While at Oshkosh, we walked around and talked with Residential Airpark vendors to see what it would take to be able to live some day in a community of pilots & planes with their own runway. There weren't too many represented but wow, the ones that were there were great. Heaven"s Landing is the one we liked the most. Probably not by accident...also likely the more expensive...what can I say, we have good taste. What better place to live than "Heaven" ? The lots are nestled in the foothills of Northern Georgia, about 3 miles from the town of Clayton. Surrounded by a big lake, huge National Forest, Tallulah Gorge (biggest gorge in the East), and only 90 mins from Atlanta if you need some big city life. There are lots up on the hillside, in which case you get a hanger in the ramp area, and there are lots along the taxiway, which of course means you get your hanger right with your house. 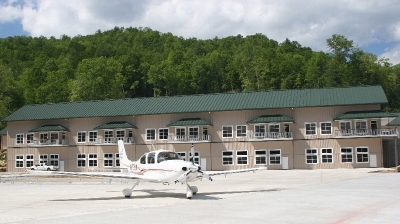 The clubhouse is beautiful, the hangers all have full baths and are big enough to have living areas in them, plus they look like regular buildings and not hangars. The picture is a row of hangars. It's double decked with a taxiway going up the backside, and the front opening at the bottom below the top balconies. Way cool! The FAA allows you to reserve your registration number for an aircraft prior to having the aircraft flying. All you have to do is ask for one, or create a unique number on your own (that follows certain rules) and pay $10/yr to have it held for you until you need it. In the picture you can see two of John Travolta's planes. He has more but these he parks at his house outside of Ocala, Fl....tough life. If you look close (or click to enlarge), the small jet is registered as N218JT and the 707 is registered as N707JT. 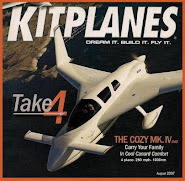 After much thought and research of available numbers, I've reserved my FAA registration number for the Cozy. We can now refer to her not just as "The Cozy", but as "N791CG". For those not familiar with phonetic aviation speak, it is pronounced...(N)ovember (7)Seven (9)Niner (1)One (C)harlie (G)olf. English is the international language of aviation and so the word "Niner" may be strange but it is used in place of simply "Nine". We do this because the verbal "Nine" in German means "No" which would not be good to say to a german air traffic controller. Saying "niner" eliminates possible confusion. So why N791CG ?? Anybody...Anybody...Beuller...Beuller? N - Required...This is the official designation of all U.S. registered aircraft. Every country is different. Now N791CG needs a name...similar to how you name a boat. Will have to work on that one for a while.